European Roulette is the most popular of the 3 main Roulette Types. As you can judge by it’s name, European Roulette gained its popularity in Europe and it still is Nr.1 choice for both, players and Casinos who are offering exactly this type most of the time. The main difference from other types like American Roulette is the Roulette Wheel, the numbers on it to be more specific. This type is often referred to as Single Zero Roulette, as the wheel and layout features only one zero versus two zeroes in American type of this game. Euro Roulette features one of the smallest house edges from all the Roulette game types. Due to the single zero, the house edge is only 2.70%. What does this mean to you as for a player? For every $100 you wager, your expected win/loss is -$2,7. Of course, this doesn’t mean that you will loose this amount every time you bet $100! Short term variance can swing into any direction and you can win $1,000 as easy as loose that amount. As this Roulette type features a relatively small house edge, it’s a great place to try some Roulette Strategies and Betting Systems at. Check out Martingale and Fibonacci strategies for some sound advice! Please note that use of these or any other strategies won’t affect the house edge and your statistical expectation will still remain negative! 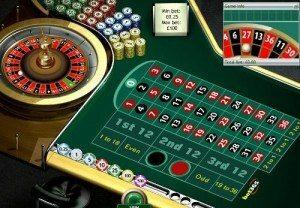 With this being the most popular Online Roulette Type, you won’t face any problems finding a Casino offering it. However, if you are a USA resident it’s rather hard to find a solid place to play online! We’ve done some research for you and listed the Best Roulette Casinos.